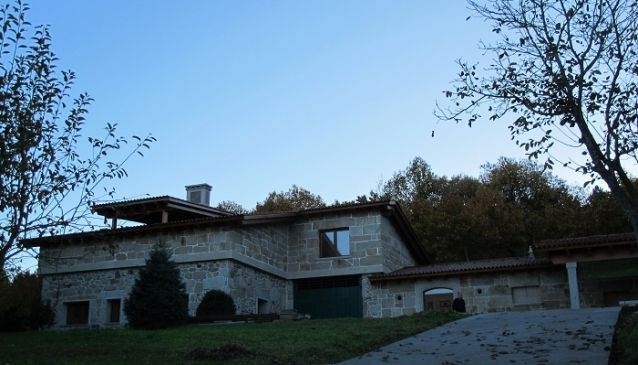 Finca of the Chestnuts is a brand new, 2-storey house for rent built to a high standard/ specification using traditional stone and wood . It has a wine cellar,chimney with fireplace, two bedrooms,large garage for numerous cars,storage areas and is fully furnished including all kitchen appliances. It's surrounded by chestnut trees/farms, with stunning views of Lemos valley including views of Monforte de Lemos and the mountains . There is also an outdoor, covered barbecue area with fixed table/chairs. The house is located in the municipality of O Ponton, belonging to Santiago de Cangas, in the City Council of Ferreira de Panton, an ideal place to enjoy nature and tranquility of the countryside. There are plenty of public footpaths nearby to explore.